Today, having dropped thirty degrees over night, we battled 30-45 mile per hour winds blowing everything from sand to sagebrush in our faces (notice my way cool coif). Our group split up and I was sent with the prospecting team (the other team quarried turtle carapaces). After a significant amount of hiking through cow pastures, and suspicious looks from cows, we found a series of buttes harboring exposed areas of the Hell Creek. Although it was a struggle to do just about anything amid the powerful wind gusts, our team managed to find yet more triceratops remains! In addition, we found a few small ‘microsites,’ or smaller sites usually of a particular level in the rock formation, that produce small but unarticulated specimens. 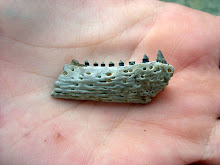 These fossils often include croc and turtle shell pieces, teeth and vertebrae like this one. Tomorrow is a well-deserved day off!